They gave me a phone number to call just in case. You weren’t supposed to need it. Federal witness protection, right? You’re safe. Except I’m calling it now between shitting bricks. “Yes, Dale, how can I help you?” The voice is calm, a slight accent. I peek out the window and see what I hadn’t seen before. Someone has left the van, climbed the telephone pole and is working among the wires. He looks up and waves at me. Other men continue toward the trailer, their fluffy ski jackets hiding whatever’s underneath. They look both ways for cars, but there aren’t any. Never are. This is 10 miles off Interstate 81 in West Virginia, an office trailer in a gravel parking lot with a pole sign that reads Tourist Information. I work for Hazard County—yeah, the feds have a sense of humor—handing out brochures to people who stop by. The voice chuckles, as if on cue. Ami is the reason I’m here. She’s a Korean-French lady—full name Ami Cho—and she operated a dry cleaner’s in Philly with her father. He owed protection money to my boss and couldn’t pay. (Dry cleaners are particularly hard hit by the recession and account for indirect job losses, Ami says. These Chinese know the economy. Am I wrong?) So her father gets moderately roughed up: lacerated spleen, earring yanked, chemical burns and whatnot. Ami freaks, and I can’t stand to see my China doll like that. So I turn state’s evidence, and it’s prosecuted as a hate crime. The Chinese consulate gets involved and I’m like Mister Hillary Clinton for a day until the feds shuffle me away. Bits of glass fall down my collar. There was no gunshot noise. Ami is hiding in the bathroom, probably hugging her knees, perfect straight black hair falling over her finely sculpted cheekbones, stained by frightened tears. See, this whole thing was my fault. I was bored so I called her. That was against the rules. No contact with friends, family or associates, no Facebook, Twitter or smart phone. Just my landline. She arrived half an hour ago. By the time she shut the door, my pants were down around my knees and we had a reunion right there on the counter. I was up for seconds when the van showed up to spoil the mood. “If you come out, we’ll do the girl quick,” comes their answer. “That’s a promise, Dale.” I know that voice. The boss himself. Torribio Bolini, aka Boli Bolinii, aka Boss Boli. Known for getting a big meal after doing someone. I always got along with the boss. Some never trusted me because I wasn’t paisan, but Boli appreciated that my family goes back to the Revolutionary War. He considers America the land of opportunity, even with the Russian mob moving in and his family reduced to small-time status. “You and I love this country,” he told me once. “Yeah,” I told him back. Suddenly there’s a noise like a lawnmower engine, except it’s overhead. Boli mutters a curse before an explosion throws me back from the wall. A second detonation rocks the trailer off its moorings, followed by the satisfying woof of a fireball. Soon the air fills with high-pitched screams of men, like a pliers-to-the-fingernails session only worse. After getting up my nerve, I peer out the broken window and see five Chinese men with revolvers methodically shooting survivors in the head, shooting the dead to make sure, shooting a severed leg for fun. The wrecked van belches fire. We’re smoking cigs in the trailer, me and Ami and her five brothers. Her head rests on my shoulder, her goddamn beautiful head. Her brothers watch her watching me, and I feel a need to say something. The brothers smile as one. Ami nuzzles my shoulder. The stench of cordite settles on us like perfume. The oldest takes the cigarette from his mouth and stubs it on the counter. He stares at me hard. Dead silence for a moment, then everyone breaks into laughter. The oldest comes over and puts a strong arm around my shoulder. Hugh Lissig is a newspaper reporter living in southeastern Virginia. 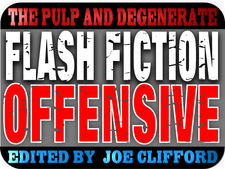 His short fiction has been published in Thuglit and Plots with Guns. Hugh's latest short story, "Victor Viral," is slated for the next issue of Needle: A Magazine of Noir. He's covered politics and government, and currently writes about the military.